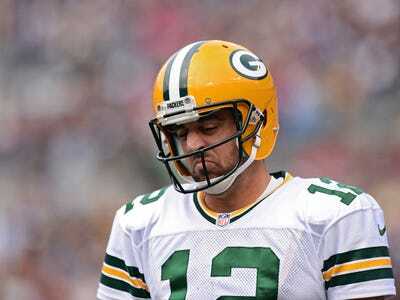 Patrick Smith/Getty ImagesCortana says Aaron Rodgers will have no problem with the Bears. It’s now 88-46 (66%) on the year. Cortana is a Windows Phone virtual assistant that’s using a Bing Predicts algorithm to predict every NFL games this year. The system debuted at the World Cup, where it correctly picked 15 of the final 16 games of the tournament. It hasn’t had that sort of wild success picking NFL games, but it has been generally decent. Cortana is 88-46, Las Vegas betting favourites are 87-44-2, and Nate Silver’s ELO model is 94-40. These records are straight up, not against the spread. There were two games that Vegas had as toss ups in Week 9 — Vikings-Redskins and Steelers-Ravens — and Cortana picked both of them correctly. Since Week 5, Cortana is 54-19 (80%). We’ll see if that hot streak continues. Cortana and Vegas agree on every game this week. There are only three lines within a field goal.